Set alongside a quiet, unspoilt coast in Lipa Noi, Tawantok Beach Villa 2 commands uninterrupted views out to the ocean. This five bedroom property offers the best of tropical living: guests enjoy direct beach access, beautifully manicured outdoor spaces, a sparkling infinity pool and shared tennis court. The tranquil environment of Lipa Noi, combined with easy access to local amenities in the vicinity makes Tawantok Beach Villa 2 a great option for family vacationers. 10 guests are comfortably accommodated across five bedrooms (two extra guests may be accommodated at additional cost). Each of the bedrooms feels sumptuous and inviting, thanks to the neutral earth toned colour scheme, wood accents, quality linen and artworks. All bedrooms offer air conditioned interiors, safes and en suite bathrooms with indoor-outdoor showers. 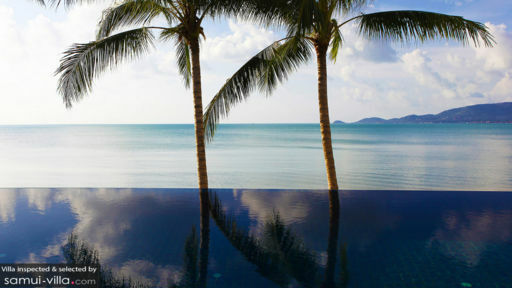 The glistening infinity pool at Tawantok Beach Villa 2 occupies a prime seafront location. Recliners frame the pool, providing vacationers with a comfortable spot to take in the views while drying off after a swim. A covered outdoor space takes centerstage in the evenings; it’s where vacationers gather for alfresco meals and relaxed post-dinner lounging. 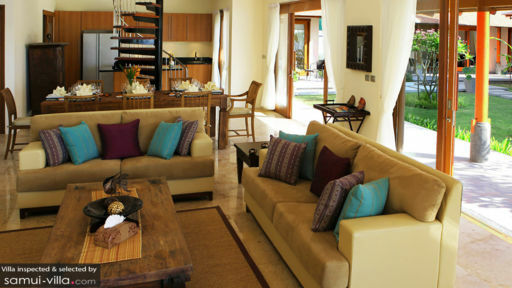 Earth toned furnishings, plump sofas and wood accents combine to create a warm and homely ambience at Tawantok Beach Villa 2. Large gallery windows create sunlit interiors, and the main living area features an open plan layout. An indoor lounge, furnished with sofas, throw pillows and a coffee table extends out to include a dining area and open kitchen. Glass sliding doors frame the living area, providing easy access to the garden. Tawantok Beach Villa 2 is a full-service property. A private chef, daily breakfast, villa manager, concierge, baby cot and high chair are included with your stay. Services available at additional cost include: villa pre-stocking, activities and excursions, cost of groceries, additional guests, airport transfers, child minding services, vehicle rental and in-villa spa treatments. 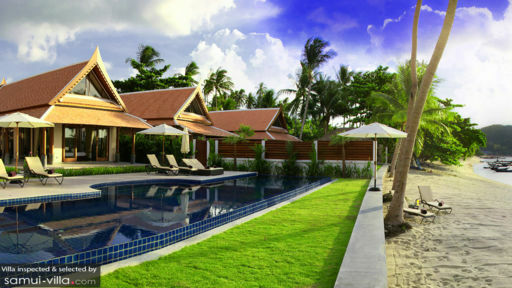 The villa is located in front of Lipa Noi Beach. Suitable for family vacationers, the area boasts a relaxed vibe, postcard-perfect scenery and easy access to attractions and local amenities. Lipa Noi and its surrounding vicinity abounds with dining options. Besides in-villa dining, there’s fine dining experiences at The Five Islands or Island View Restaurant and incredible seafood restaurants at Thongkrut Fisherman’s Village. Air Bar, an upscale rooftop venue is a great bet for rounding out your evenings with a nightcap. We also like unwinding on Sundays with a lazy, indulgent brunch at Nikki Beach Club. A yoga class at Marga Yoga or a spa ritual at Baan Thai Spa by HARNN are some of our favourite ways to unwind in South Samui (there’s also the option of in-villa yoga classes or massages - just ask your villa manager for further details!). The lively Nathon Night Food Market offers a family experience, and is a great place to discover the local and shopping scene. Our recommended attractions for cultural sightseeing include Samui Cultural Center, Wat Samut Tharam and Laem Sor Pagoda.